The Fantasy Sports Gaming Network is presenting the first Fantasy Football Tournament For The Fisher House Foundation (@FisherHouseFdtn). The league is a 8 man best ball draft only format on MyFantasyLeague.com. No waivers, trades or setting lineups. There will be new leagues created until the opening day. We are currently at eight leagues and the winner of each league, after 13 weeks, will then enter into a three week total points pool to determine the winner of the tournament! Your $20 buy-in will go to The Fisher House Foundation. Play with experts, casual fans, and network with each other. A jersey giveaway is in the works for the winner. Big thanks to Blake Sullivan (@BlakeSullivanFF) and for organizing this! Six of the first 8 players drafted were RBs. Antonio Brown and DeAndre Hopkins were selected ahead of Alvin Kamara and Melvin Gordon. Best of all the winnings go to the Fisher House Foundation!!! @TheRealNFLGuru tripled down on the RB position, adding Jerick McKinnon (RB12) to Elliott and Hunt. @TheFSGN went the opposite route and added Rob Gronkowski at TE to Brown and Thomas, leaving him as the only team without a RB after three rounds. Five of the other 6 teams had a 2 RB / 1 WR start to their drafts, except @mike_petrop who found his RB1 in Devonta Freeman (RB13). A.J. Green and Mike Evans were the only WRs drafted. LeSean McCoy and Jordan Howard were the only RBs drafted. After four rounds, we had 16 running backs and 13 wide receivers selected. All 8 teams had at least two RBs, except @TheFSGN, who continued to ignore the RB position, making Aaron Rodgers the 1st QB off the board, 28th overall. The final pick of the 4th round was Travis Kelce, 32nd overall. Wow! @MyFantasyChamps has donated a championship ring to the “Fantasy Football Tournament For The Fisher House Foundation”. 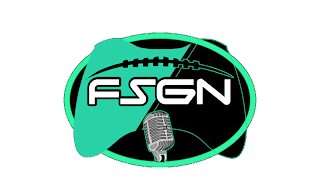 @TheFSGN is pumped to be working with them. More room in the league, $20 to the Fisher House for a chance at the ring, VIP pass to Big Guy Sports and more!! @DynastywiseClay drafted Zach Ertz while @TheFSGN finally selected its first running back - Jay Ajayi (RB19). Every team ended up drafting two QBs and every team, except @DweezeNutz, drafted two TEs. He better hope Greg Olsen plays 16 games! @WeTlkFntsySprts drafted both RBs from the Saints(Drew Brees too!) and Titans. No other team drafted RBs on the same team. @reynoldst58 stacked Cam Newton with Christian McCaffrey and Marcus Mariota with Corey Davis. No owner drafted WRs on the same team. In an 8 team bestball, it is pretty easy to get pretty pumped up about your team because of the talent you are able to get. However, the other rosters are also full of major talent. I grabbed DJ at the 1.02 because his bestball ceiling is very high and should catch a ton of balls which helps in the ppr format of the league. At the 2.07 I grabbed my guy Keenan Allen who I am HUGE on this year because we saw how great he can be when he plays a full season and I expect him to do the same this season as well. To compliment DJ I grabbed McCaffery for his value as a receiver and he can be a solid pick in a bestball format. Then I worked on gaining depth at WR and RB and looked for players that have high ceilings such as Amari Cooper, Allen Robinson, Corey Davis and Josh Gordon at the receiver spot. At RB I added Royce Freeman who I expect to be the lead back in Denver and get plenty of touches and a big playmaker in Marlon Mack, Then I grabbed a safer running back who isn’t a lot of flash but always consistent in Lamar Miller. I went for mobile quarterbacks in this bestball format and grabbed Mariota and Newton due to their ability on the ground as well in the air which improves their value to me in bestball. Lastly, for TEs I went more youthful but high upside and grabbed George Kittle and David Njoku and I think both will have solid seasons and will compliment each other in this format. Even though it is an 8 team league I have high hopes for this squad and I am thankful for the opportunity to give back to a great cause.